A spotlight presentation with a Moran work that was on loan to the Center. It now back home with the Smithsonian American Art Museum. Throughout the summer, many docent- and staff-led programs and tours are presented highlighting masterworks in the Whitney Western Art Museum. 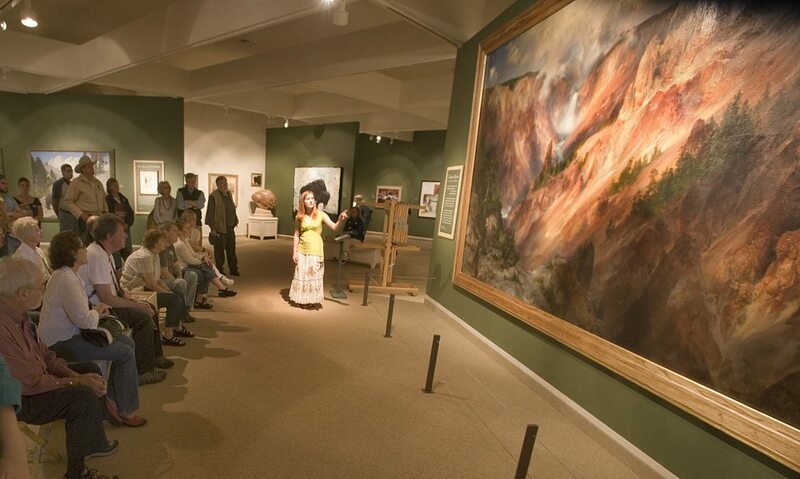 Hear stories about artists, their work, and history while visiting. There’s something for all ages, so please come join us! When visiting the Buffalo Bill Center of the West in the summer, be sure to ask about that day’s programs in our front lobby. You might find programs of interest are scheduled in the Whitney Museum as well as our other four museums. In June 2017, the Whitney presented a symposium on western American sculpture. If you missed the symposium or would simply like to review all you learned at it, the presentations are available on video! CLICK HERE. The Whitney sponsors artist-in-residence who demonstrate in the gallery and talk with visitors, generally from 9:30 a.m.–3:30 p.m. Our 2017 artists-in-residence included Jeff Rudolph, Michele Farrier, Dustin Payne, John Hitchcock, and Seidel Standing Elk.